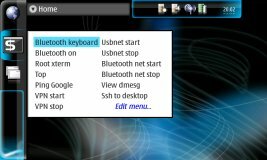 Upir's Maemo Pages Nokia 770, N800 and N810 software. 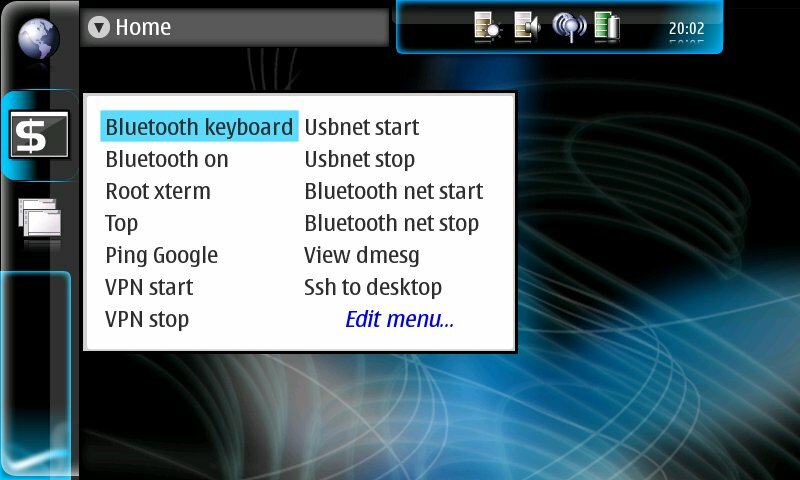 Several different layouts for the on-screen and sliding keyboard, including possibility to create your own layout. 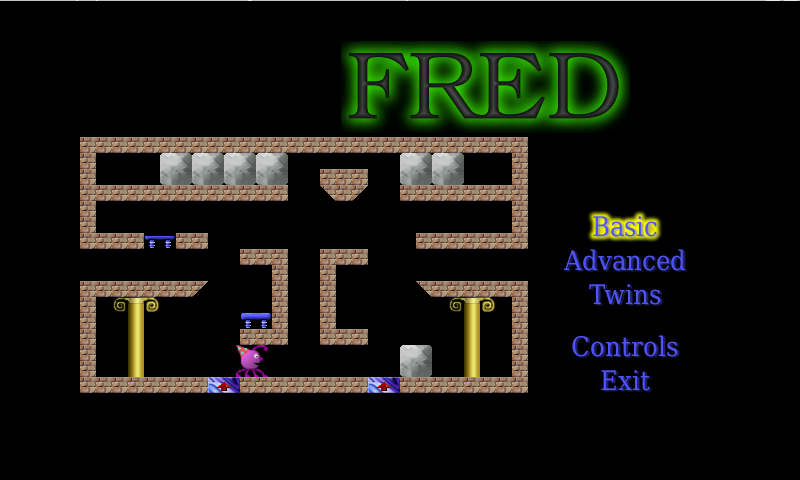 Fred is a logical arcade game. 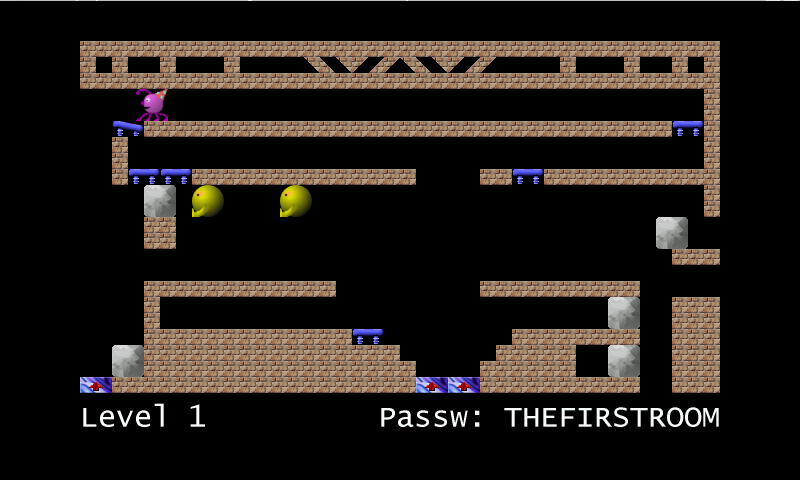 The goal is to navigate a little pink spider, Fred, through the system of platforms. 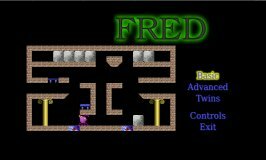 Fred can not die–you can touch whatever objects you like and fall from arbitrary height. You cannot go up. Well, at least if you don't use a special "lift" platform to levitate. Have you seen a levitating spider? There are more creatures than Fred in the game. Baggers. Yellow, dull, apathetic straight-moving spheric critters. They cannot harm Fred. But they are stubborn. Bagger heads for the certain fixed point and won't disappear until he reaches it. But even when he vanishes, you haven't won yet. If anything touches a trampoline platform... here he goes again. There are some "undocumented" keys in the game. In the main menu, by pressing + or - key on the top of your device, you can switch languages (currently only English and Czech). In the game, pressing the Back key gives you a game menu. The game also contains a level set for two players. It's hardly playable on N800 due to lack of hardware buttons, though. Fred is quite old project inspired by a game "Fred +3" dated to good old times. First version was written for MS-DOS, later it was rewritten in C under Linux. Thanks to SDL, the library used for graphics, it was easily ported to Windows. 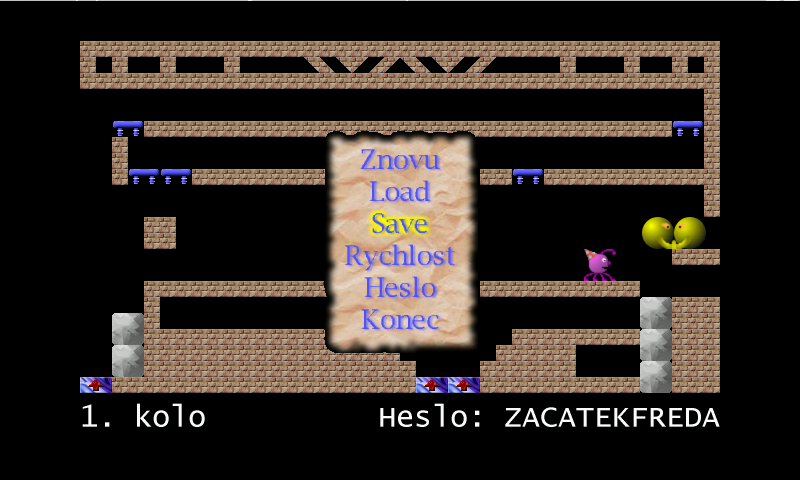 Recently, English language was added (the previous versions were in Czech only) and the game was slightly modified to support the Maemo platform. Useful tool for ukulele, mandolin or four-string banjo players. 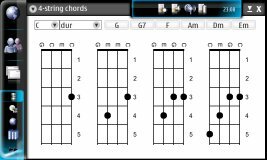 The tool computes the chords, therefore it is able to display chords for any four-string instrument. Currently, a few tunings (various ukulele, mandolin and banjo tunnings) are predefined. For other instrument, you will need to set a custom tuning (select "Preferences" from the menu, "Custom" from the Tuning box and select the right tone for each string). Please send me (jbenc at upir dot cz) the tuning and name of your instrument and I will add it to the next version. 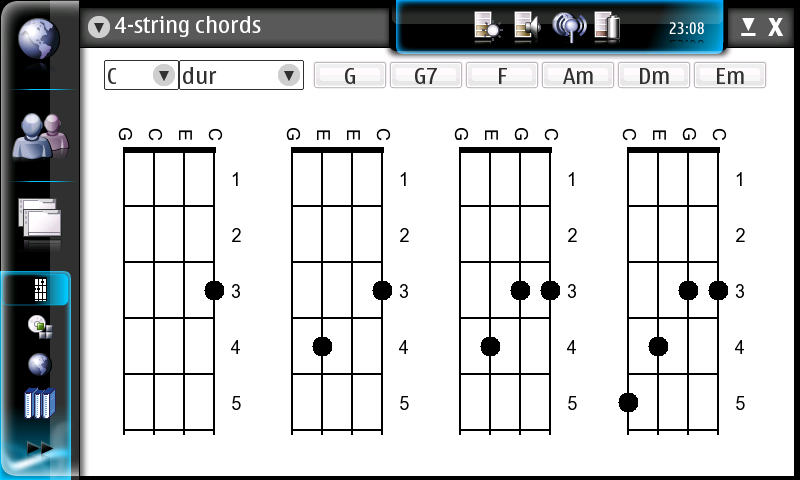 English and Czech chord and tone names are supported. If you want other language, send me tone and chord names in that language. If you have an idea how to make the tool even more useful :-), share it with me. Please note that it's unlikely I would extend the number of strings. Nokia N810 (and N800 running OS2008) doesn't contain support for Czech and Slovak format of date and time, numbers, etc. This package adds the support. A tool for hackers. Command navigator is a task navigator applet (see the screenshot if you don't know what "task navigator applet" is) allowing execution of an arbitrary command. See the Command navigator homepage. Command navigator is no longer maintained. All programs presented on this page are released under the General Public License (GPL) version 2 unless stated otherwise. The source codes for most of the programs are available from the Maemo Extras repository. The source code for cmd-navigator is available on its homepage (see above), the source code for posix-locales-cz is available here under the LGPL license.